Written by roxeteer on October 27, 2010 to Live and Marie Fredriksson. MALMö - Marie Fredriksson will perform together with her husband Micke Bolyos at the inauguration ceremony of Citytunneln, a 17-kilometer rail link between Malmö Central Station and the Öresund Bridge. As the grand finale, HM King Carl XVI Gustaf of Sweden will officially open the tunnel for traffic. The ceremony will be held next to the Malmö Central Station on December 4 and is free to the public. Written by tevensso on September 23, 2010 to Live and Roxette. Written by tevensso on August 21, 2010 to Live and Roxette. Source: Hallandsposten. HALMSTAD - More than 17,000 in Sundsvall, almost 30,000 in Skanderborg, up to 20,000 in Marknadsplatsen in Halmstad, Sweden on Saturday and then sold out in Norway and is already stocked in Russia. Roxette's comeback has exceeded all expectations. Even for a pop visionary like Per Gessle. - Yes, indeed. We were not prepared for it to be so big. When Anderstorp came up, we were happy if we could sell 7000 tickets, says Gessle. - So had we known this we would have rehearsed more and had a larger production. I mean, before the last Roxette tour, "Room Service" in 2001 we rented the Globe Arena for a week. We're sitting in the garden at home in the house in Sandhamn where the Gessle family has spent the entire summer. Åsa offers freshly baked sponge cake when Per has poured the coffee. - The advantage of living in two places is that it becomes a feast every time you come home to Halmstad. The calmness. The old friends … Yes, all this stuff, explains Per, pointing out towards the Laholm bay. September 13, 1994 on the Crash!Boom!Bang! tour - that's how long ago it's been since Roxette last played in Halmstad. Almost 16 years ago. - That's why it will be fantastic to do it again. I just talked with Marie and she's on fire about it, says Per. 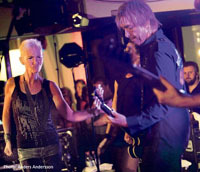 That Per Gessle and Marie Fredriksson are standing on a stage together at all again as Roxette is a minor miracle, given the brain tumor that Marie suffered eight years ago. - Yes, one should know that five percent will survive the disease that Marie had, and she had the good fortune to belong to the five percent. Ít's in that perspective you have to put the comeback and the concerts. It is not the old '80s Roxette, but what Marie's doing is an achievement. - Sure, everything takes longer now and her health goes in waves, but it is the reality we live in. And therefore, these concerts are more of a test to decide on how much she can handle before a regular tour. For instance, we are not doing any press before the concerts. - So if it will continue is up to Marie. But as I see it this is good for her - it is probably the best rehab she can get. Written by tevensso on August 12, 2010 to Live and Roxette. Source: Aftonbladet. HALMSTAD - Halmstad police fears chaos when Roxette plays in town on Saturday. The reason is that BiljettNu still is selling tickets to the show, while Live Nation claims that any BiljettNu tickets sold after July 9 are invalid. There will be 20 police officers, 30 guards and 100 people from Live Nation on site. "We are way more people than usual," says Carl Pernow, CEO of Live Nation and continues "we will build up different lanes for different tickets. BiljettNu tickets [sold after July 9] are not valid." BiljettNu will also have staff on site. They are not there in any official capacity but to show their customers that they care. "Fans with BiljettNu tickets will be allowed to enter. If Live Nation won't let them in, it's up to them" says Magnus Nilsson, CEO of BiljettNu. Per Gessle's comment is "I think it's terrible that BiljettNu continues to sell tickets they know are invalid. BiljettNu are obviously aware of that there are no contracts between BiljettNu and Roxette or the local organizer. Still they go on and it's 'Joe Sixpack' that gets to take the blow…"
Important info regarding Roxette tickets! Written by tevensso on July 13, 2010 to Live and Roxette. Source: Live Nation. LiveNation warns ticket buyers to not use unauthorized sellers! After the Roxette concert August 14 was moved to Halmstad, Biljett.nu are no longer authorized to sell tickets to the concert. However, LiveNation has found out that Biljett.nu still sells tickets to the concert - they will not be valid. Tickets bought from Biljett.nu after July 9 are not valid for the concert. Tickets bought before July 9 are valid. Three-day race tickets are not valid. Per Gessle himself stresses that you should get your tickets via Ticnet. HALMSTAD - This morning an additional 3000 tickets to the Roxette concert in Halmstad were released - and sold out in 24 minutes! The Roxette concert is therefore moved from Brottet to Marknadsplatsen in Halmstad and more tickets are already up for sale. Written by roxeteer on July 13, 2010 to Live and Roxette. Source: d&d management. Roxette’s concert on August 14 has been moved to Brottet in Halmstad. The reason for this is that the 3-day event "The Race Legends" in Anderstorp Raceway has been canceled due to financial problems of the organizers. Tickets for the concert at Brottet in Halmstad will cost 500 SEK plus service fee and will be sold via Livenation.se, Ticnet 077-170 70 70. They will go on sale July 13, 09:00 CET. ONLY concert tickets bought for the concert in Anderstorp will be valid for the concert in Halmstad, NOT race tickets, and additional tickets will ONLY be sold via Ticnet, NOT Biljett.nu. Update: The concert has been moved to Marknadsplatsen.